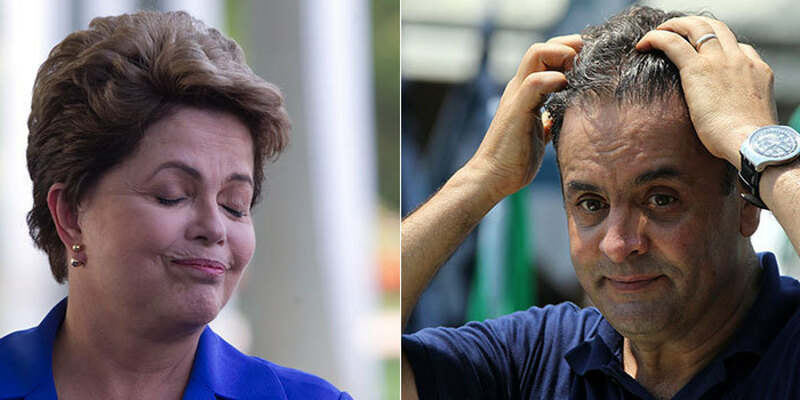 ← Brazilection 2014: Latest polls: A final momentum shift? João Schlüter with the very latest from the Brazilian presidential election which will take place on Sunday, October 26. The election is three days out and the polls continue to move in favor of incumbent Dilma Rousseff. 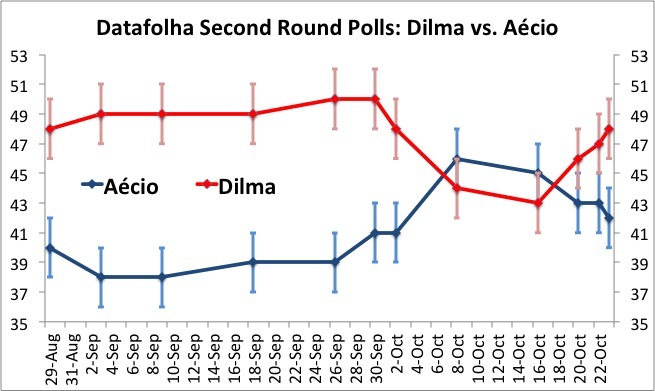 New Datafolha polls out on the 22nd and 23rd of October had Dilma rising to 47 and then 48 percent with Aécio falling to 42 in the latest poll. This is the first result outside the margin of error (plus or minus 2 percentage points) since the first round of voting. Blank and invalid votes are at 5 percent, undecided voters as well. Now what does this mean? Not much, says the Aécio camp, after all the polls were pretty far off in the first round. However, they generally were right about the momentum. They did see Aécio rising as the vote approached, they just didn’t see him as clearly ahead of Marina Silva as he ended up on election night. Extrapolation of the trend over the last view polls could have given you a good approximation of the first round result. 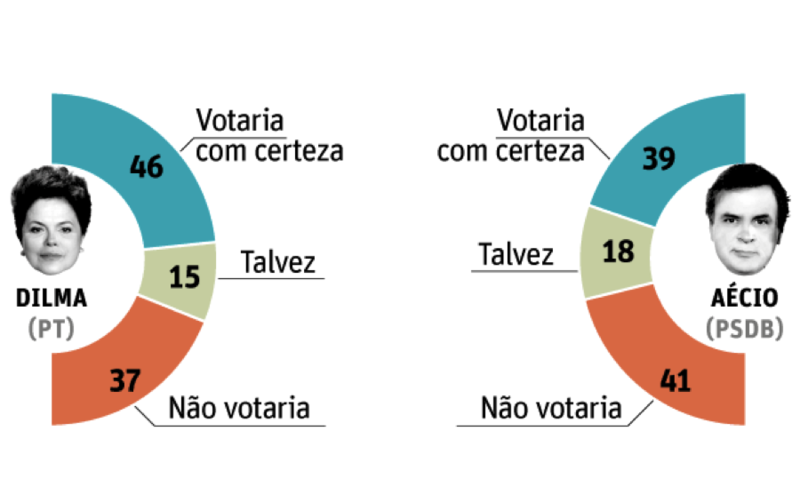 Right now, such an extrapolation (which I don’t endorse) would show a clear Dilma win. A point can also be made, that the electorate is much more decided now than in the first round when there were 11 candidates (3 serious ones) and possibly a lot of last minute switching from Marina to Aécio. My view is that the polls do provide a realistic picture of the field on in the week before the vote. For Aécio to win, he will likely need something to happen between Thursday and Sunday. 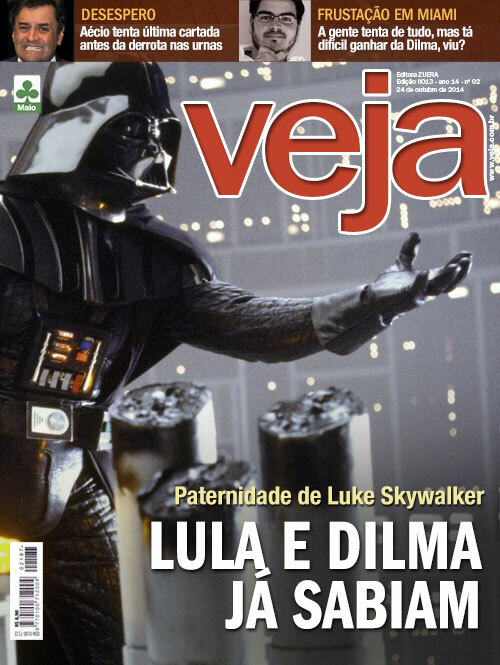 A sort of October surprise occurred on Thursday night (23 Ocotober) as Veja – Brazil most read weekly news magazine released it’s cover story for the edition to be released the following day. It states that President Dilma as well as her predecessor Lula knew about the massive kickback scandal at public oil giant Petrobras. The story is based on the alleged (non-public) testimony of money-changer Alberto Youssef, one of the key defendants in the ongoing investigation. This could be a big deal. While the scandal has been ongoing for a few months, so far Dilma was able to deny any involvement or knowledge of the ongoing corruption in the company she oversaw as minister for mining and energy (2003-2005). 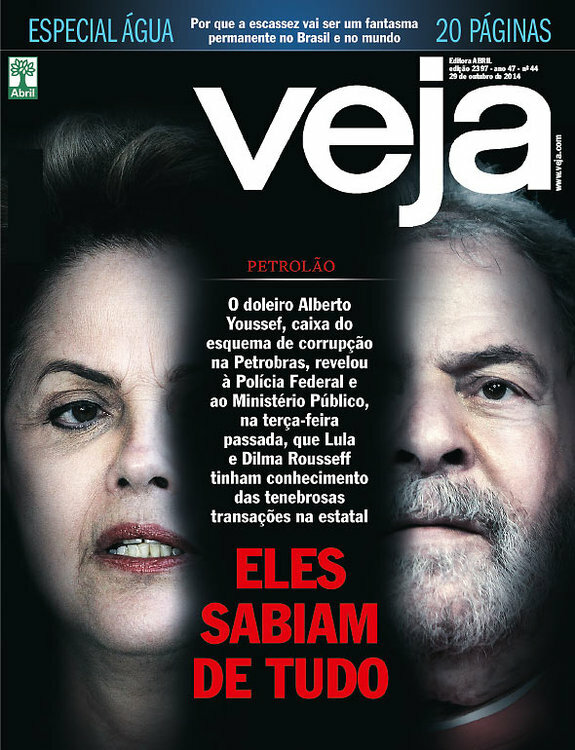 Now, Veja has a well-known anti-PT bias and a history of releasing anti-PT headlines right before elections. Also, the great majority of Veja readers can be safely expected to be in Aécio’s corner already, while those leaning towards Dilma are likely to be skeptical of Veja and other mainstream media outlets that are seen as biased against the PT government. What will be interesting is how this piece of news plays out in the final days of the campaign. There will be one more debate, on Friday (October 24), on Globo, Brazil’s dominant TV network. This debate may be the make-or-break moment for Aécio. Clearly he will use this fresh and explosive ammunition in a last minute effort to break Dilma’s momentum. The seleção’s biggest star urged his compatriots to vote (valid) in a one minute video and declared his support for the Tucano. This comes after dozens of celebrities endorsed either candidate, including Lindsay Lohan (who know she was a Brazilection follower?). That Dilma and Aécio grew up 7 blocks from each other? That the most powerful party in Brazil is neither Dilma’s PT nor Aécio’s PSDB? That 17-year old Aécio told a new Jersey Newspaper in 1977 that in Brazil women don’t have to work and spent most of their time shopping and at the beach? So this is it for right now. If anything important happens before Sunday I will let you know. Otherwise we will all be wiser by Sunday night. Don’t forget to participate in our No Se Mancha poll, right here below. This entry was posted in Brazil and tagged Aécio Neves, Brazil, Brazil Election 2014, Dilma Rouseff. Bookmark the permalink.